Jean Cerfontaine is a South African author with research interests. During his PhD and MBA studies, he became involved in non-fiction writing and published two academic works through Lambert Academic Publishing. Since then, he has published various non-fiction pieces on Healthcare Policy under his real name in the South African press, including the Business Day newspaper. "Where do you go to" is his debut fiction work. He is married and has three dogs. In Where Do You Go To by Jean Cerfontaine, the year is 1948, Marie-Claire is eight years old, lost, cold and covered in blood. She can remember nothing of the events that brought her there, apart from a strong feeling she is escaping from something. She finds refuge in a nearby church and falls asleep, waking up in an orphanage just outside Rome the following day. Marie-Claire is soon adopted by the French ambassador and his wife. This is the beginning of a new life, travelling with her parents across post-war Europe from Greece to Moscow, where she is a promising student of the Bolshoi ballet. By 1965, Marie-Claire is living in Paris and mixing with the elite of society. She seems to have everything, but Marie-Claire is haunted by dark and sinister dreams. Are they a clue to her mysterious past? A chance encounter is about to uncover the truth behind that fateful night of 1948. Prepare to be transported back to postwar Europe in this well-researched and engaging novel based on the song by Peter Sarstedt. The author really grabbed my attention with the opening scene and that continued throughout the book. Marie-Claire was such a beautiful character. Although she lived a very affluent lifestyle, she never lost her humility and compassion for others. The detail in the narrative is excellent and really transports you back to the eras of post-war Europe and the Communist Soviet Union. The characters were realistic and came to life, as did the setting of the story. This book has taken me on a wonderful journey emotionally. There are great moments of conflict and plot twists, but I never could have imagined the truth behind Marie-Claire's nightmares. The ending will bring a tear to the most hardened of hearts and the last line, ‘the pillow was dry’, was perfect. Where Do You Go To (Marie-Claire Chronicles) by Jean Cerfontaine is the gentle tale of Marie-Claire’s life, based on the famous Peter Sarstedt song. Marie-Claire wakes in a freezing cold Rome, a young child who is under-dressed and with no idea how she got there or even who she is. A French diplomat adopts her from the orphanage and so begins a new life for her. From Athens where she learns ballet to Moscow in the Cold War and Paris where she rubs shoulders with the rich and famous in the 1960s, Marie-Claire is living a life she never dreamed possible until the past comes crashing back. Can she finally discover who she really is, where she came from and what happened to her? Can she finally banish the nightmares that have haunted her all her life? Where Do You Go To (Marie-Claire Chronicles) by Jean Cerfontaine is a literary adaptation of the popular Peter Sarstedt song and, as you read it, you can see how the story is based on that song. This is an easy read, almost a diary of Marie-Claire's life – the ups, downs and in between and, if you like stories of travels across Europe, you will enjoy this. Her journey is described vividly, allowing the reader to see in their mind where she is and what it was like in each era. The plot has some intrigue and suspense, a twist at the end that you might not see coming, and the characters make an intriguing cast. This story appears to be a mixture of genres which makes for interesting reading. Recommended for anyone who wants to read something different and relaxing. Marie-Claire’s life has changed immensely from the day she woke on a street in Rome with no idea of who she was or where she came from. Her own intellect, kindness and caring allowed her to change her life forever, helping her to find a home with a wealthy ambassador and his wife. With travels through Italy, Greece, France, Rome and more, she grows up as a cultured and highly intelligent young woman, excelling at nearly everything she sets her mind and her attentions to achieve. But Marie-Claire has still never recovered her memories of just what she may have been running from on that cold day so long ago, until the embassy party ... leading her to an amazing discovery she never could have imagined in Where Do You Go To by Jean Cerfontaine. Marie-Claire seems to meet friends wherever she goes and each of those characters is drawn out along the way. Whether it’s her friends Karin and Arianna from the orphanage or Andros from her time at the Greek embassy, or even Peter from the small café down the road from her apartment, you get to know each of them and to love them the way she does. But her story, though it’s a rags to riches one, has still always eluded her. 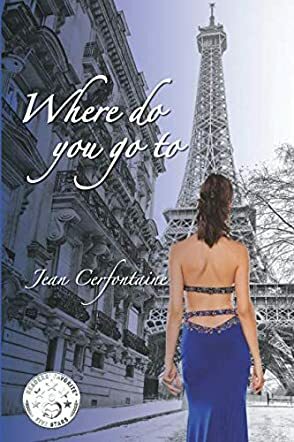 Her story is definitely one that you will never guess but you’ll be rooting for her every step of the way, as she overcomes obstacles from the KGB to the Bolshoi and so much more in Where Do You Go To by Jean Cerfontaine. A little girl with a head injury woke up near Rome and had no idea who she was or how she got there. She was taken to Marcigliana, an orphanage, where she spent the next few years of her life. The nuns were kind teachers, and the little girl with amnesia was named Marie-Claire. One day Mr. and Mrs. Henri le Blanc, who had not been able to have children, arrived at the orphanage and chose her to adopt. As Henri was a French diplomat, the family soon moved to Greece, followed by Moscow. They were wealthy and vacationed in St. Moritz in the winter and the French Riviera in the summer. While living in Moscow, Marie-Claire’s talent as a ballet dancer blossomed, and she studied at the Bolshoi Ballet Academy. Eventually, Marie-Claire and her parents returned to Paris. She studied art at the Sorbonne and became a part of an elite group of famous singers, writers and artists. During all these years, Marie-Claire had sad dreams, waking up with tears on her face, not remembering what secrets the dreams contained. In Where Do You Go To, written by Jean Cerfontaine, Marie-Claire’s earliest years seem to be an unreachable memory. The exquisite landscapes and homes of the Le Blanc family form a beautiful background of a young woman’s life. The author paints picture after picture of the most stunning cities and landscapes in Europe during the 1950’s and 1960’s. The far-reaching consequences of World War II and the communist regime are intertwined throughout the story. Author Jean Cerfontaine has skillfully crafted an intriguing historical fictional work in Where Do You Go To. It is an unforgettable book!